Hundreds of thousands flock to southwestern Utah’s Zion National Park each year to witness the famed Zion Narrows, where the majestic Virgin River has sculpted a 16-mile stretch of cavernous bends and twists seemingly unique in their beauty. Midway across the state, however, Capitol Reef National Park boasts a comparably spectacular alternative in the remote Halls Creek Narrows. Here a spring-fed stream has carved into the Waterpocket Fold a series of deep incisions so curvy that the bending stream nearly doubles back on itself. 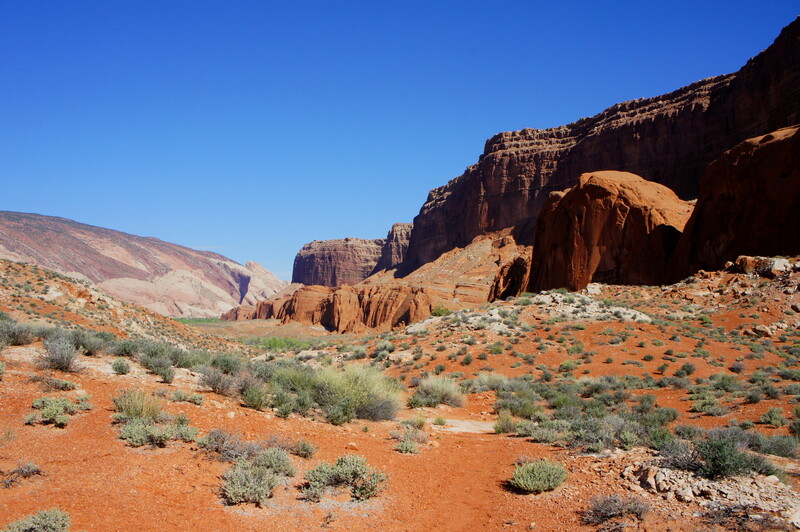 The result is a stunning landscape of towering walls and sweeping amphitheaters that is perhaps the best in all of Capitol Reef. Better yet, even during peak season (spring and fall), it sees fewer than a half-dozen visitors on a given day. 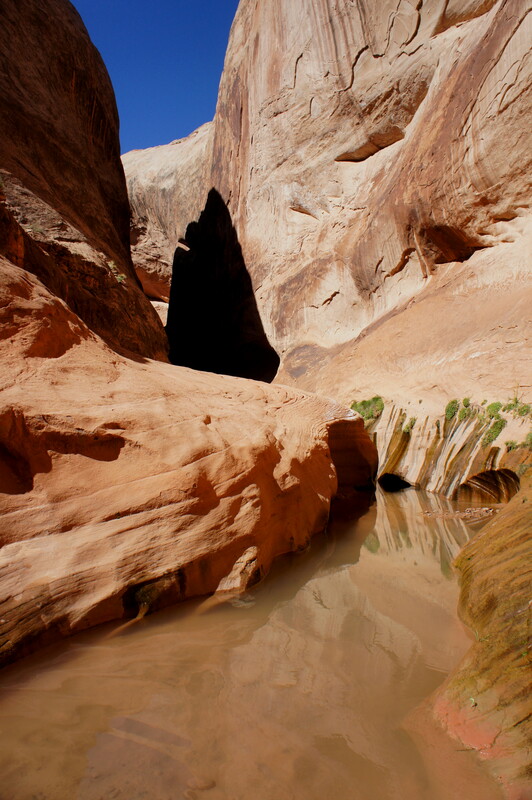 Capitol Reef’s best-kept secret owes its privacy to two related factors. 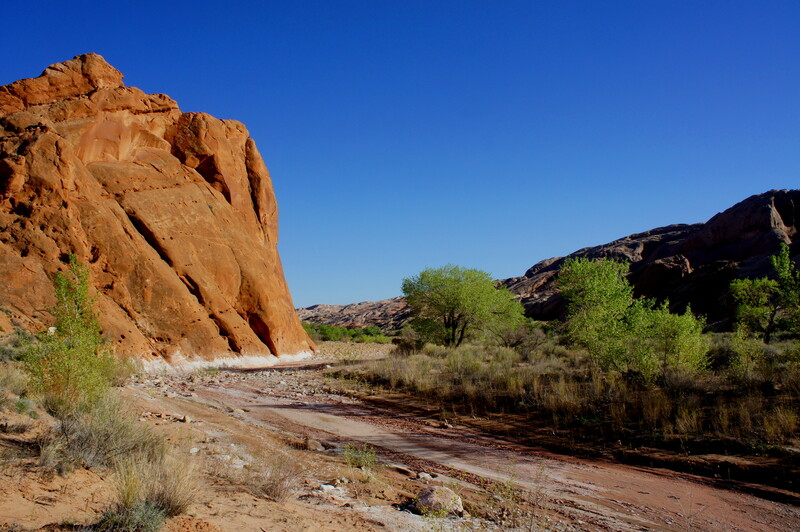 First, the Halls Creek Narrows are situated in Capitol Reef National Park’s extreme southeast corner, dozens of miles from the closest semblance of amenities (stores, gas stations, etc.). 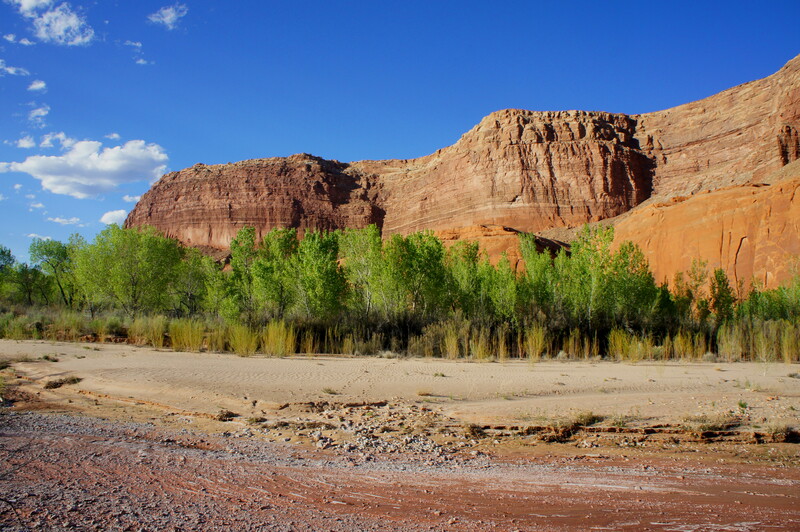 It is a nearly 3-hour drive, mostly along unpaved roads, from the Capitol Reef Visitor Center on Utah Highway 24 to the Halls Creek trailhead. 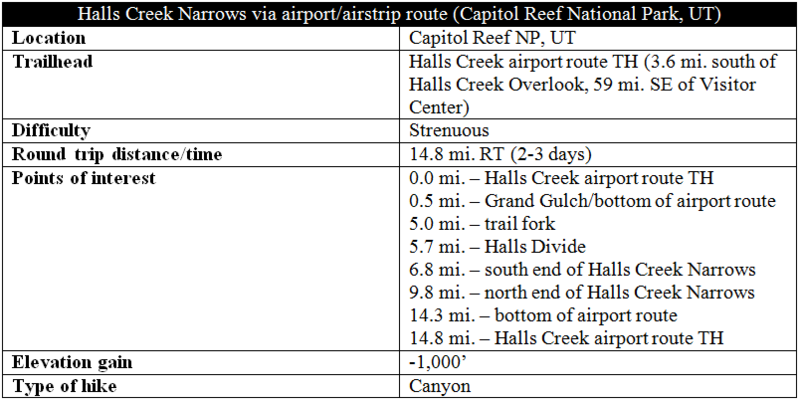 Second, even the shortest feasible approach (see below) requires a 5-mile one-way hike to the narrows. The 15- to 23-mile round-trip is completed as either a very long day trip or a 2-3 day backpack (for overnighters, a free permit must be obtained at the Visitor Center). On top of the remoteness, reaching the narrows demands considerable preparation, endurance, and route-finding abilities well above average. 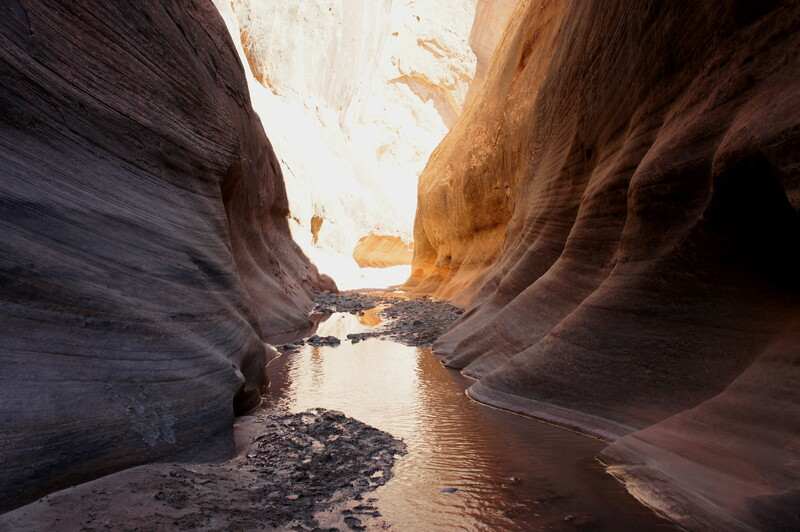 While the narrows are cool and shaded, the lengthy approach through dry and sun-soaked Grand Gulch is anything but. Summer should therefore be avoided. Until reaching the narrows, treatable water is scarce any time of year. A final consideration involves where to begin the hike. 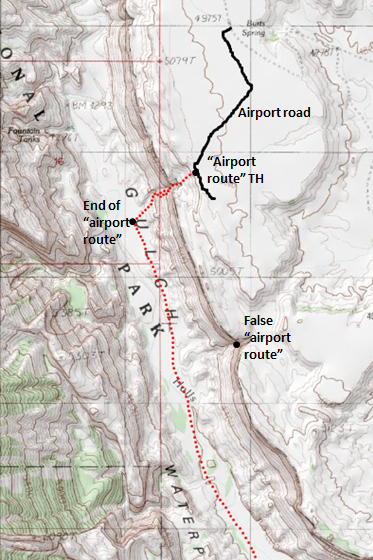 Two trailheads exist—the advertised, well-marked start at Halls Creek Overlook and an unmarked, but occasionally used track dubbed the “airport route” (or “old airstrip route”). Both have their advantages and drawbacks. The airport route comprises an intensely steep and challenging Class 3 scramble down a boulder-strewn ravine to the valley floor. 700 feet in elevation loss are covered over the course of ½ mile. While possible to avoid any Class 4 climbs, prudent decision-making is required, especially when carrying heavy packs. The principal advantage of the airport route is quicker access to the Halls Creek Narrows; tackling the arduous ravine slices a roughly 23-mile round-trip hike down to about 15. 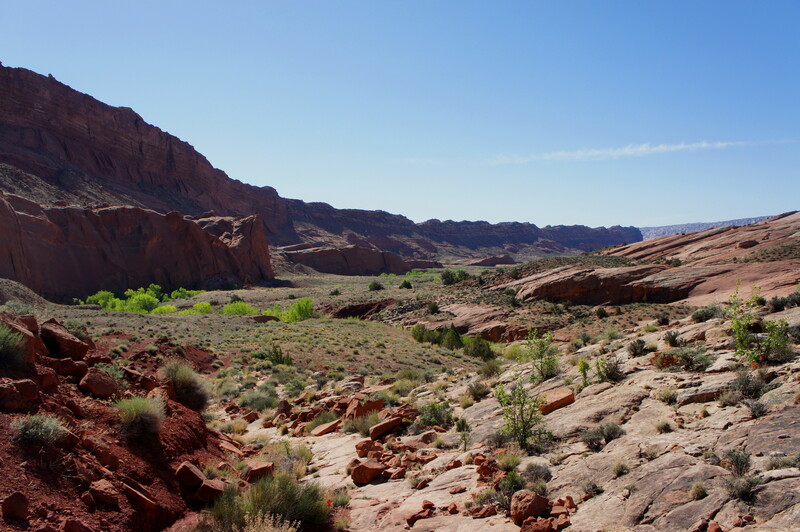 Though longer, inexperienced backpackers and those unconformable with exposed scrambling should instead follow the traditional route from Halls Creek Overlook. While this route also demands a steep, 800-foot descent, it follows a well-established, better-marked path down to Grand Gulch. Due to the relative lack of beta on the route, the following describes the approach to Halls Creek Narrows via the airstrip shortcut. (For the conventional, Halls Creek Overlook option, see here and here.) To reiterate, the airport route is simply that—a route, not a maintained or even frequently-worn trail. It descends an extremely sharp incline and requires 1-1 ½ hours to cover the ½ mile from the crest of Big Thompson Mesa to the bottom of Grand Gulch—each way. Hikers attempting this route should have excellent footwear, scrambling experience, route-finding capabilities, and considerable patience. Others are advised to descend from the Halls Creek Overlook. Begin the hike by descending cross-country down to the V. Sporadic rock cairns may exist, but the way is relatively straightforward and, with the exception of a multi-tiered drop down a bench at the start, requires no difficult scrambling. At the brim of the crack sits a “No Hunting” sign—it helps to identify this marker before dropping down to the next level. From the signage, a faintly cairned route leads down into the ravine before bearing slightly to the right. 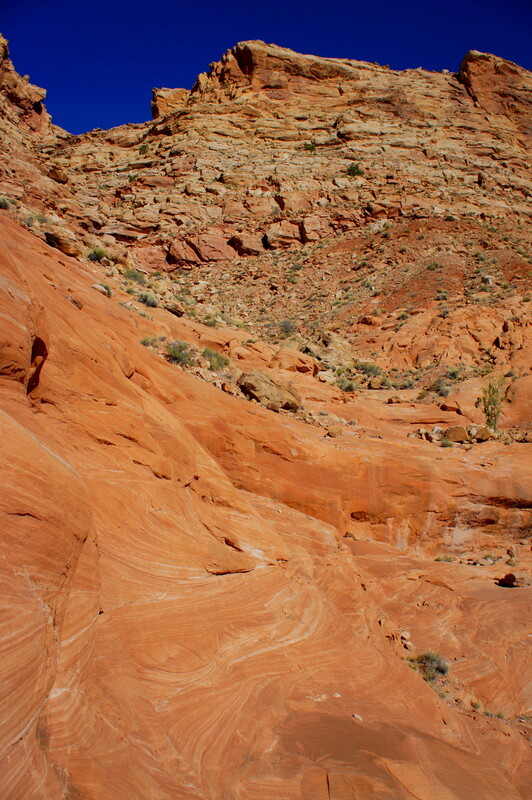 Every few yards requires either a gentle drop or traverse across narrow ledges. The crux of this section is to stay to the left-hand side until just above a vertical pour-off, briefly cross to the right side to clear the pouroff, then careen back over to the left above an even larger dryfall. While hiker-made cairns dot the slope on both sides of the drainage, the safest and simplest route remains on the left-hand side for the remainder of the descent. Clear of the trickiest down-climbs, the simplest route swings considerably off to the left. It is important in this section to be patient: it is almost always safer to switchback down each cliff bench than to descend them straight on, especially with full packs. It is possible to complete the entire climb without having to tackle anything near vertical—or anything that demands weight-bearing on hands to keep one from falling. For the geology-minded, it is worth noting that the airport crack slices through three sedimentary rock layers. The brown-to-tan Salt Wash member of the late Jurassic Morrison formation accounts for the top half of the descent. Then, after a brief foray into the slightly pink-tinted Summerville member, the bottom third gleams a burnt orange color—this is the classic Entrada sandstone of Arches National Park lore. Across the valley to the west lies the bread-and-butter of the Waterpocket Fold, a jumbled strip of whitish Navajo sandstone fins and needles, capped by a more gently-tilting slope composed of the older Kayenta formation and Wingate sandstone. It is possible to make out to the north a crumbly, crimson-colored hillside of rocky debris—this is the famous Red Slide. Back to the descent, the airport ravine’s ledgey middle section is composed primarily of the Summerville and, with a scarcity of reliable cairns, quickly becomes a choose-your-own-adventure. Once hitting the orange Entrada, however, there appears to be only one feasible option. 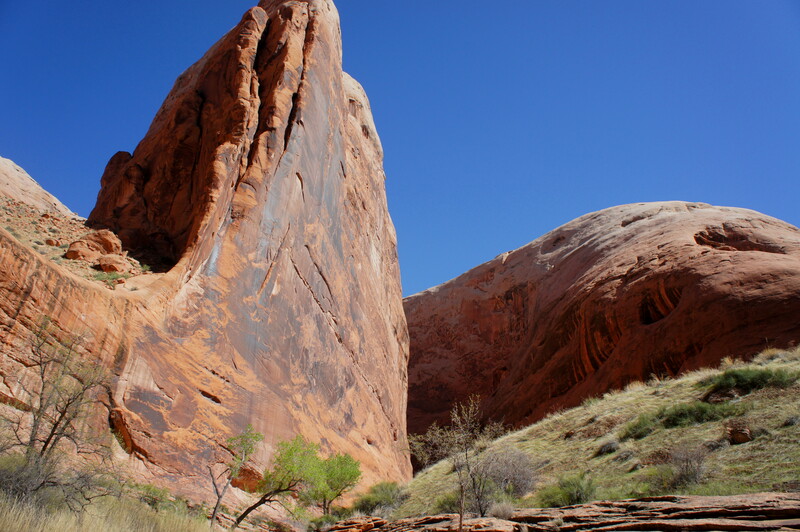 If one were to bear slightly right (north) down the ravine or straight down the gut (due west), near-vertical drops of at least 50 feet in the Entrada would bar any plausible descent. This is the principal reason why staying to the left (south) side of the ravine is essential. 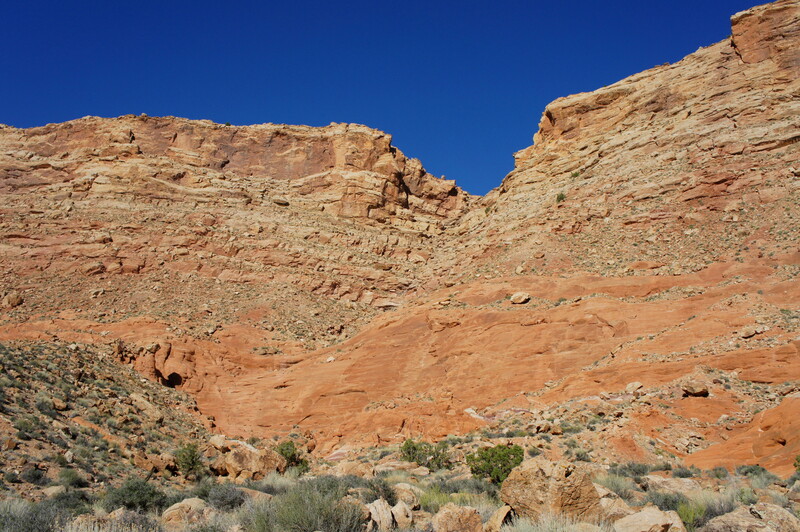 Once hitting the Entrada, look for a cairned path—well left (south) of the center of the drainage—that leads down a rocky, north-bearing slide. The declivity here is significant but is not exposed, making it relatively easy to negotiate. From the bottom of the slide, it is a straightforward scramble down to a now-visible, sandy track heading west across a brushy flat toward Halls Creek. Follow this use trail until it intersects with a more heavily-trafficked path heading north-south. (Note: As of March 2015, the junction was marked by a 4- or 5-foot stick protruding vertically.) At this point, the arduous airport shortcut is officially complete. Turn left onto the well-worn track heading south. From this point, the Halls Creek Narrows remain 4.5 miles away. But the ramble down Grand Gulch is level and relatively straightforward. Perhaps one mile down the trail, a rugged ravine that closely resembles the airport cut is visible on the left. It is important to recall this steep gully for the return hike so as to avoid a premature climb. From the bottom, the gulch appears considerably more difficult than the airstrip route, and an ascent would, of course, miss the proper trailhead. At a point 20-30 minutes south of the route junction, the trail crosses Halls Creek for the first time. The streambed here is, in most circumstances, mostly or entirely dry. But it supports a variety of plant life, including groves upon groves of gnarly Fremont cottonwoods. Being at a lower elevation than the park’s most trafficked hotspots farther north, Capitol Reef’s southeast corner is a prime location to observe undisturbed spring wildflowers. Following the initial crossing of Halls Creek, the trail crosses the streambed at least three more times over the course of an hour and a half. As the surrounding brush thickens, stream crossings become increasingly frequent—and Halls Creek begins to hold gently flowing water. 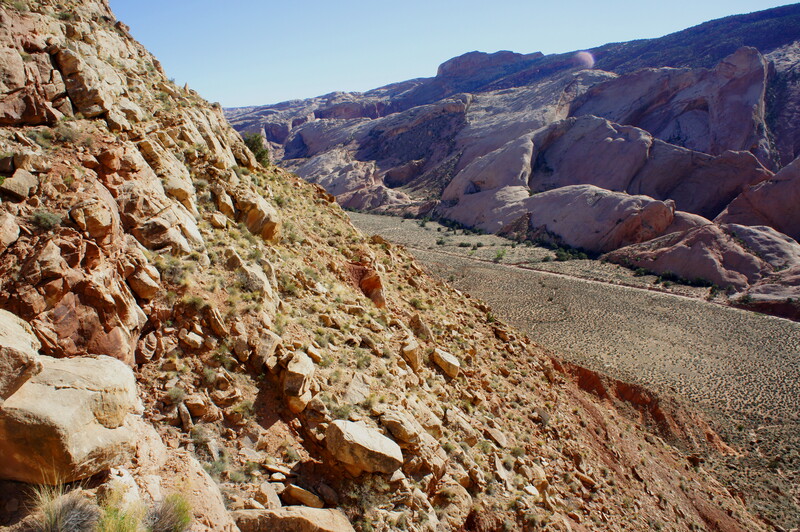 Capitol Reef’s current backcountry rules allow for dispersed camping (with a free permit), and this area boasts a number of attractive campsites. While the Fold continues to sport seemingly unending, wavy slopes of Navajo to the west, observant hikers will notice a subtle change in the geological landscape to the east. Here the Summerville formation, previously subdued, is prominently featured. This pink-shaded stratum, dating to the Middle Jurassic Period (~160 million years ago), forms the crux of the west-facing cliff faces of Hall Mesa on the left. 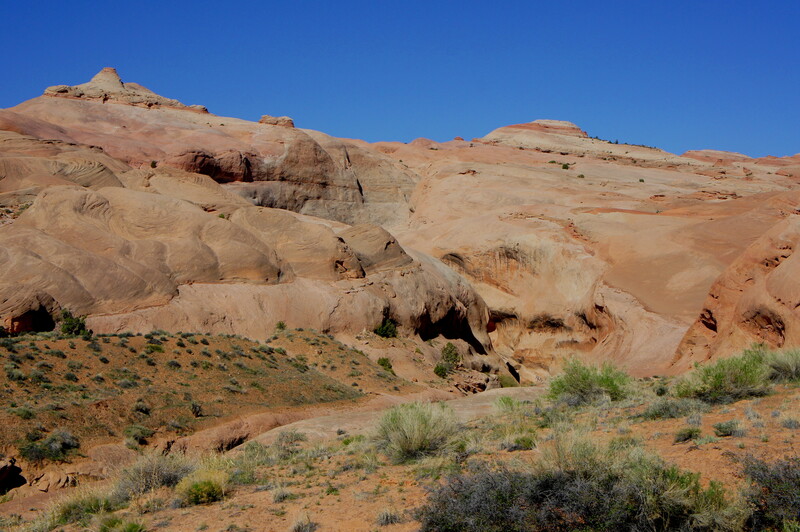 Below the Summerville is a seemingly unending line of orange Entrada sandstone outcrops, a handful of which protrude almost out to the creek. About four miles from the bottom of the airstrip route, the terrain becomes noticeably hillier. 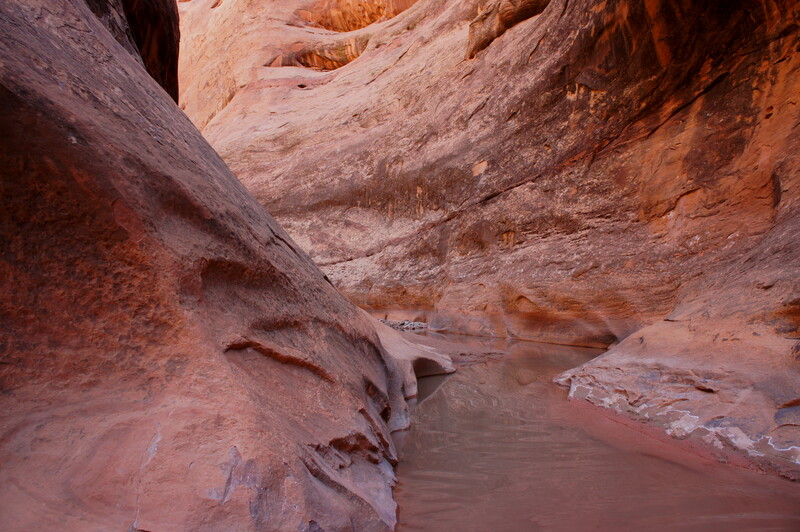 Roughly around this point, Halls Creek flirts with the cream- to tan-colored Navajo sandstone, often streaked with a black coating of desert varnish. By my count, Halls Creek weaves through two shallow, left-hand curves in the Navajo before spitting out to the east again to skirt a minor outcrop in the ruddy Carmel. At a point approximately five miles from the trailhead, the route splits. The unmarked junction—often cairned but quite easy to miss—serves as the start and end point for the 5-mile loop portion of the hike. 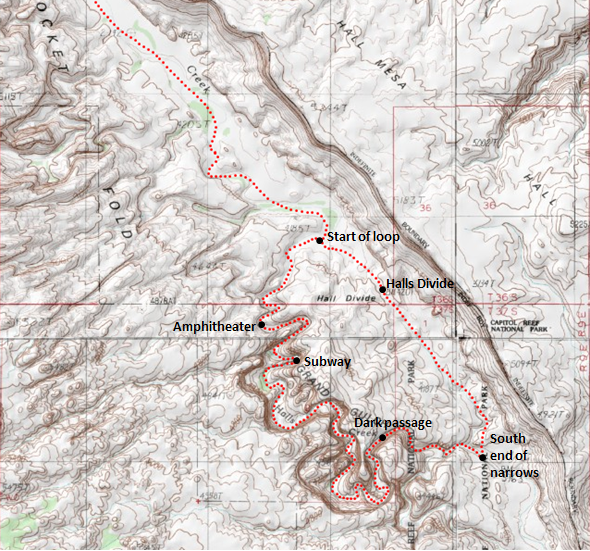 Hugging the streambed as Halls Creek cuts southwest leads into the 3-mile narrows; a dusty track bearing southeast through Grand Gulch leads up and over Halls Divide, a low pass situated between the Fold and Hall Mesa. Several arguments can be made for completing the loop in a clockwise direction—tackling the dry and exposed divide first, then the cool and wet narrows. First, approaching Halls Divide from the north minimizes the elevation gain, ascending a mere 100-150 feet up to the pass, followed by a longer, 200-foot descent. Second, consider the time of day. Most hikers will have spent their first night in the vicinity of the route junction. An early start over Halls Divide the next morning covers the hottest and most exposed section before the arrival of the scorching afternoon sun. Conversely, morning light in Halls Creek Narrows is poor; this spectacular, 3-mile stretch is best enjoyed around midday. Third, due to the near-guarantee of wading in the water-logged narrows, completing Halls Divide first reduces the time spent with wet boots. Fourth, photographers hoping to catch nice reflections in Halls Creek are less likely to do so following the flow of the stream, as hiking in the creek inevitably muddy the waters downstream. Finally, those who prefer to save the best for last will want to wait to experience the narrows. 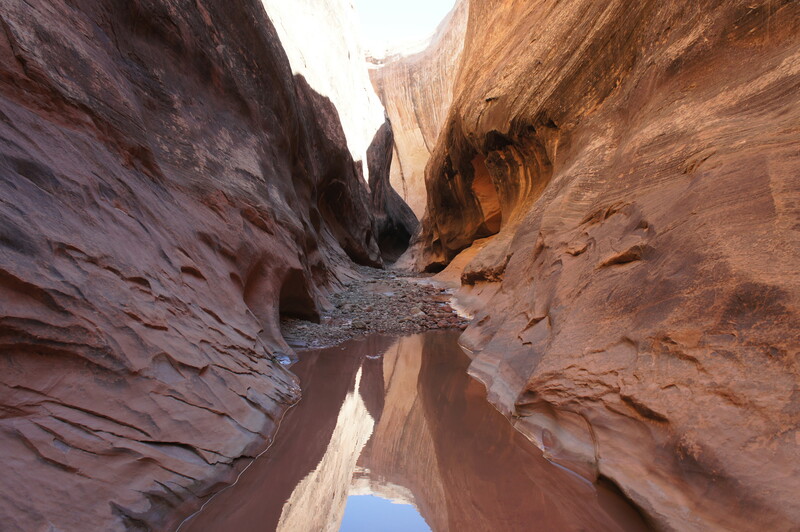 Moreover, hiking up to Halls Divide in the morning also benefits from the best light on the Waterpocket Fold, and tremendous views of undulating Navajo sandstone to the west begin almost immediately. Leaving west-bearing Halls Creek behind, a faint but probably cairned use trail begins gradually ascending alongside a north-south bearing tributary. Staying to the left of this minor draw, a better-worn path appears shortly after clearing the stream-fed vegetation. The sudden lack of tree cover delivers fine vistas to the north and west. For most of the 1.8 miles up and over Halls Divide, the route follows an old, overgrown road used in the first half of the 20th century for tourism, as well as access to uranium mines. While the track is no longer suitable for vehicles, it provides a guide for hikers clambering up and around a series of flushed Carmel slopes to the divide. A reasonably fit hiker should be able to reach the high point (roughly 4,200’) in around 20 minutes. The descent from Halls Divide to the far entrance to the narrows is longer and follows a shallow ravine dotted with sagebrush and prickly pear cactus. About a mile from the crest of the divide, the trail passes a heavily-vegetated tributary of Halls Creek to the right. From here it is a simple southward descent back down to Halls Creek, where the shady cottonwoods and spindly reed grasses return after a 2-mile hiatus. Having bagged nearly seven miles of hiking to this point, visitors are finally rewarded with the hike’s crown jewels: the magnificent Halls Creek Narrows, which begin almost immediately upstream. The exultant entrance is dense with vegetation, but the canyon quickly narrows, blocking out all but the most stubborn ferns and riparian flowers. The walls in Halls Creek Narrows start at a modest 50-100 feet high, but they quickly gain loft (by the middle of the narrows, cliffs on the left side rise as sharply as 800 feet). More impressive than the height, however, is the walls’ stunning decoration. Nearly every face is laced with orange and black streaks of desert varnish, strips of iron or manganese oxidized by tiny microbacteria over the course of hundreds or thousands of years. 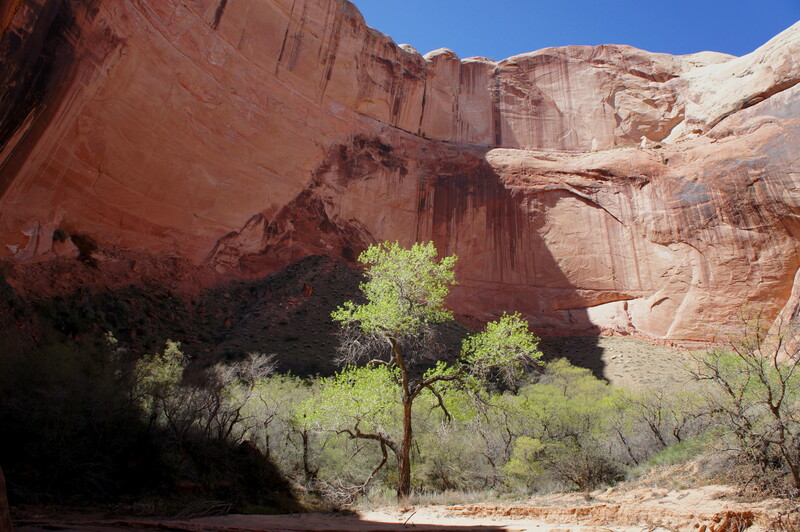 Capitol Reef has its fair share of desert varnish, but there is perhaps no better place to see it in such abundance than Halls Creek Narrows. 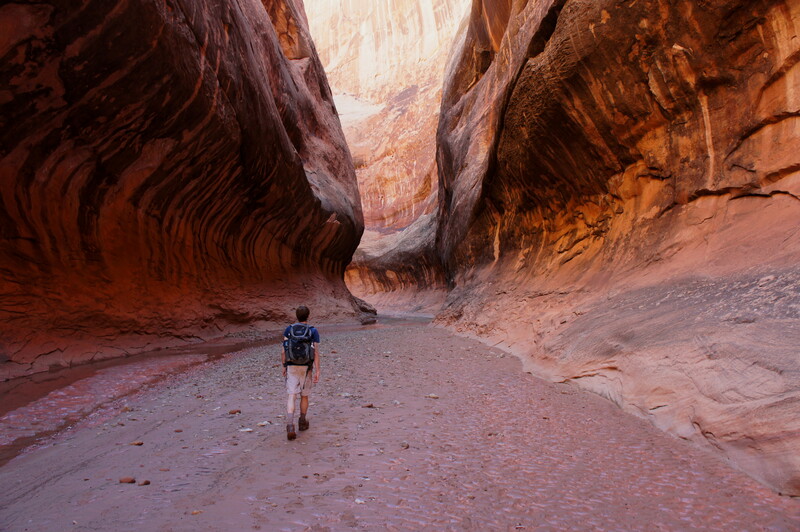 For the entire 3-mile length of the narrows, there are no cairns or other markers to indicate the way—but with sheer vertical walls on both sides, it is nearly impossible to get lost. Depending on water levels, it is potentially possible to avoid getting one’s feet wet for the first ½-¾ mile, but stretching and rock-hopping to avoid soggy socks simply delays the inevitable. 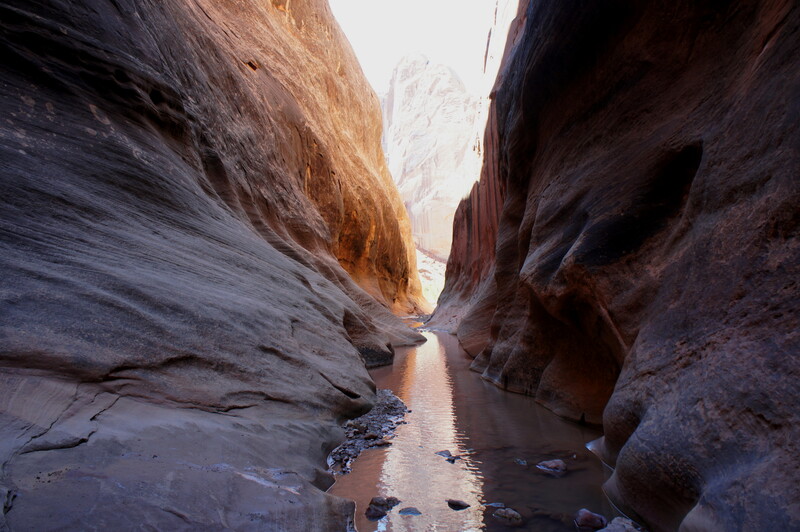 Just short of the one-mile mark, a scintillating stretch of high, shadowy narrows is frequently preceded by a significant pool (thigh-deep as of March 2015). Great climbers may be able to skirt the creek via a sketchy bypass on the left, but most will want to pull up their socks and pants and tackle it head on. Moreover, while open-toed sandals may sound like the footwear of choice, consider the fact that they are likely to fill with sand and gravel (and take up precious space in a backpack). Sturdy water shoes or tightly-tied, waterproof boots are the preferred method. While rarely frigid between March and October, expect water temperatures in Halls Creek to be around 10-15 degrees cooler than each month’s median air temperature. After the pool and dark passage, the canyon widens and groves of vegetation return to the sandy banks of Halls Creek. An orange and black fin on the left-hand side ushers in the next narrow traverse and a second murky wade (waist-deep as of March 2015). The next mile comprises alternating stretches of deep cuts and open expanses. Several spectacular bends boast varnished undercuts 400 feet high. It is interesting to note the dearth of side canyons entering at surface level – evidence of how effective the flowing creek (enhanced by flash floods) has been in down-cutting through the Waterpocket Fold. The few tributaries visible all end with sheer drops into the principal drainage, making them inaccessible to all but the most adventurous climbers. Around two miles from the start of the narrows, Halls Creek weaves through a wonderful subway section, followed ten minutes later by a beautiful, fluted passage. The latter, which often holds high water (knee-deep as of March 2015), ends at a sweeping alcove supporting hanging gardens. On most days, this should mark the end of the necessary wading. 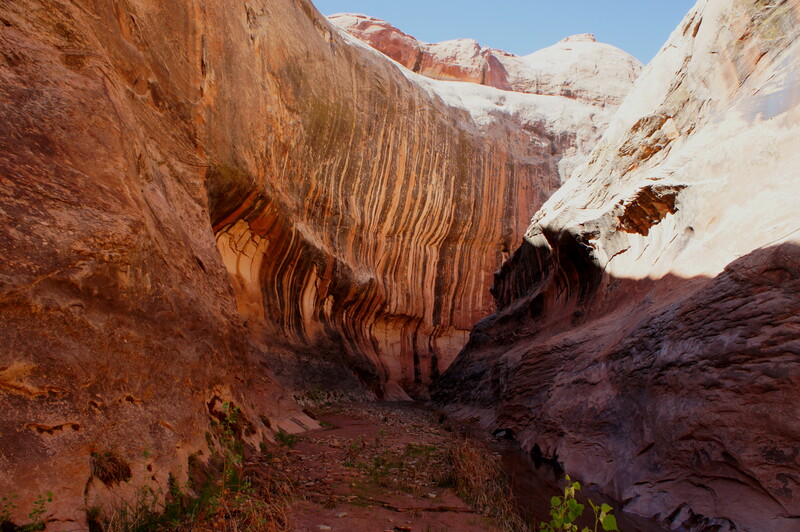 The final stretch comprises one more set of fluted narrows and a mammoth overhang known to Capitol Reef rangers as “the amphitheater.” It is worth resting here for a few moments to soak in the beauty of the sinuous bend, the last major attraction of Halls Creek Narrows. It is a 10-15 minute walk from the amphitheater back out into the sunny expanse of Grand Gulch completing the 5-mile loop section. Backpackers with three days may choose to either set up a final night’s camp in one of the shady cottonwood groves or work their way back up the valley a few miles to lessen tomorrow’s hike. 2-day backpackers can complete the 5-mile loop, plus the 5-mile return journey, in one long day. However, it is worth remembering that the airport route can be just as trying—if not more demanding—to ascend as it was to climb down. This entry was posted in Capitol Reef National Park, Strenuous Hikes, Utah and tagged airport route, airstrip route, amphitheater, backpacking, best hike in Capitol Reef, Big Thompson Mesa, canyon, Capitol Reef, desert varnish, Entrada sandstone, Grand Gulch, Hall Mesa, Halls Creek, Halls Creek Narrows, Halls Divide, Narrows, Navajo sandstone, shortcut route, Summerville formation, Utah, Waterpocket Fold. Bookmark the permalink. I’ve been going into the backcountry in S-UT/N-AZ for 27 years & just scratching the surface! In the early ’90s, the Burr Trail switchbacks were nasty & narrow & tough even in a SUV… Drove the entire Notom Rd, the HITR road to the Hurricane Wash – stock SUV wouldn’t make it to L. Powell then, the Shafer Trail in Moab, etc., in an FWD Audi then. The Halls Creek’s been on my list 25 y! 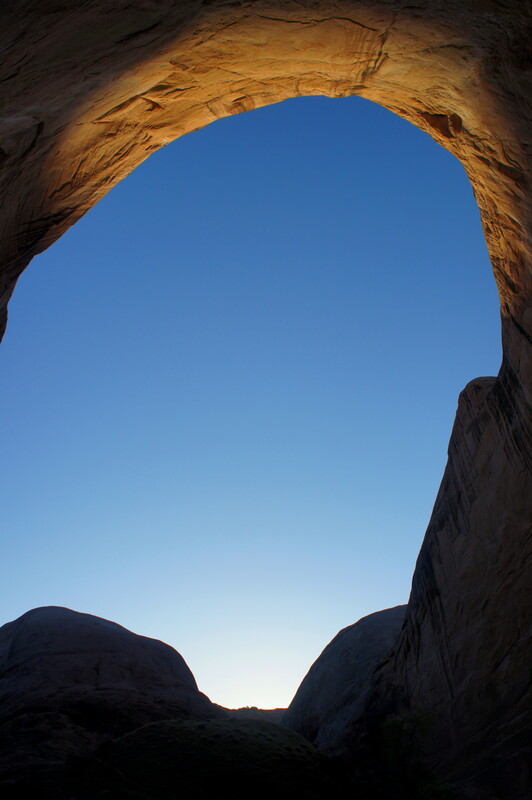 Don’t wanna do it alone… You’ve missed a double-arch above the narrows or right next on the S side, though. BTW, are you a geologist? I am. Send me your email & I send you your photo that caught my eye. I took the liberty editing it w/ Topaz Labs SW & it looks better; I am a semi-pro w/ a good eye for the formations fascia. In two weeks, we plan to fly in and use a rental car to do this hike. Do you think we could get to the shortcut in a standard low-clearance rental car? Hi Elise – unfortunately you’ll need something with good clearance (like an SUV or truck) — and preferably something with 4WD — to reach the trailhead. You might be able to try to go as far as you can with a low-clearance vehicle, park it, then walk the remaining distance on the Halls Creek Road – but because I can’t remember exactly the rules about parking in a non-designated area, I would recommend calling the park to ask! Great description. Any suggestions on how to turn this into a longer trip with say two additional days/40 plus miles ? Also what’s the earliest can do this- mid March ? Thanks ! Brilliant route! Instructions and topo were easy for me to follow. To qualify my statement, I have a lot of experience with old school land nav. Can’t say how this is for someone with less experience. The airport rout delivered as stated in terms of mileage and time. However, it was on the very edge of my wife’s strength and endurance level. This is a strenuous if not impossible route for beginners. There are a couple of 4th class sections. This means you will get severely hurt or die if you fall but ropes are not practical or necessary if you have experience. I have an alpine rock and desert climbing background so I felt completely at home. My wife and kids all have climbed so the tech section were not too bad. For people with less experience I would totally avoid this route! Glad to hear you made it, and definitely worth reiterating as you have: the airport route is not for beginners. The airport route is tough and can test one’s patience, but going slow and making prudent decisions is essential. Hi Andrew! I’m curious if you have any of the GPS coordinates for the key points on this route. I’m taking this route with some friends this Memorial Day (skipping the shortcut – we have a variety of experience levels, and I don’t want to risk it), and it would be great to be able to plug coordinates into our GPS. The topo map you’ve included is helpful, but I’d love to be able to recreate it accurately. Hi Emilie – unfortunately I do not have the GPS coordinates for the hike. Sorry about that! 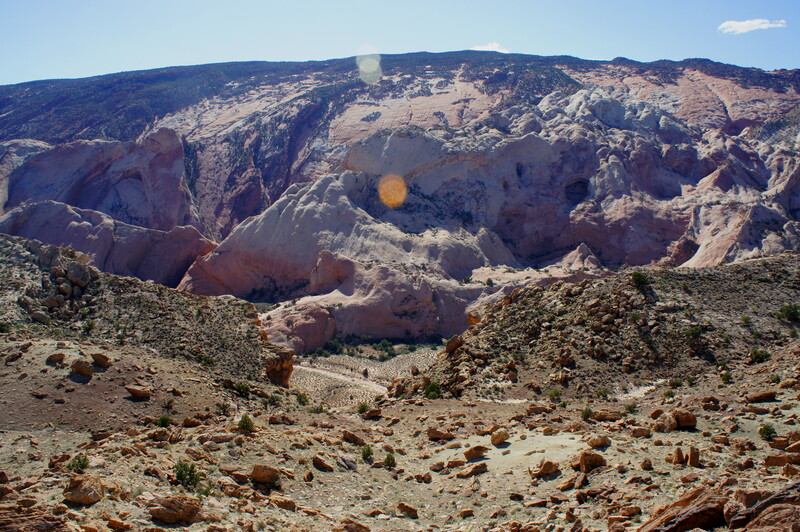 Other sites may have them – or perhaps the Capitol Reef Visitor Center. No worries – thanks for the response! You had so much detail, I figured it was worth asking. 🙂 We’re excited for the trip!